If you have not found the perfect Valentine's Day gift for the beauty junkie, have no fear. Posh Beauty Blog has some amazing last minute gift ideas – from super luxurious to super affordable, there are ideas for every budget and for men and women. I love Jurlique and these select items are perfect for Valentine's Day with their beautiful packaging! Jurlique Limited Edition Rosewater Balancing Mist Intense Deluxe Edition : Enriched with nourishing Rose Essential Oil and a unique blend of precious Rose extracts, this special edition of Jurliques worldwide #1 bestseller makes the perfect Valentine's Day gift. It restores skin and hydrates it, keeping it refreshed, balanced and soothed Bonus: This product is dermatologist tested and free from PEGs, silicones, and colorants. Formulated without parabens, sulfates, and phthalates. The fragrance is made from a 100 percent natural blend of rose extracts. Jurlique Rose Love Balm : A natural salve that moisturizes, softens and protects dry or chapped skin. Infused with the natural scent of roses. It soothes sensitive, dry or chapped skin on lips, cuticles, elbows or anywhere skin is chafed and irritated. The Rose Love Balm is Lightly scented with tangerine oil, it protects against moisture loss and provides antioxidant protection. Jurlique Essence of Rose Roll on Fragrance Oil: This signature Jurlique fragrance captures the essence of the world's finest Rose Oils, Shea Butter, and the purity of Jurlique's very own organically grown Rosa Gallica in a sleek, pop-in your purse sized bottle. Alluring, feminine, floral and modern. Capri Vince Camuto is the newest addition to the brand’s signature fragrance collection. Capri Vince Camuto is a passport to adventure and reminder of spontaneous summer days and sultry nights. Capri Vince Camuto is an effervescent, floral-fruity fragrance with citrusy top notes of Violet Leaves, Juicy Pear, and Pink Grapefruit washed over a floral bouquet of Peach Blossom and Violet Flower revealing a rich heart of Musk and Vanilla. Nice balancing act #UnboxDSC, @esietukeme. You're getting a DSC shirt in the mail. Share yours. If we repost it, you get a shirt. Dollar Shave Club is a gift that both he and she will love! What better gift could you give a man this Valentine's Day than the gift of convenience and a consistently close shave. Dollar Shave Club is a subscription-based company that sends high quality razors and grooming supplies right to your door for a few bucks a month so you can always shave with a fresh blade. NO matter where you are in your relationship, Dollar Shave Club makes a great gift. This is also a gift that women will love. FYI: Pink packaged anything comes at a premium, with no difference in quality. Close to twenty percent of Dollar Shave Club members are women. It's one of the best kept secrets that men can give to their special lady. Prices start at $40 for a gift membership. 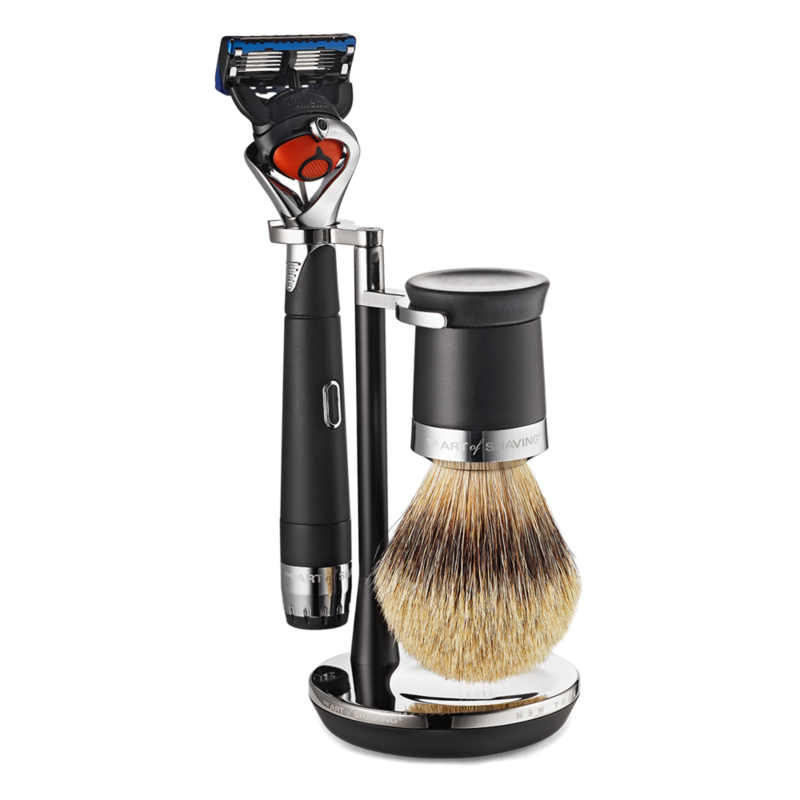 This luxury shaving collection is a great gift for a man of distinction. The Lexington Power Razor emits gentle micro-pulses to deliver a clean, smooth shave with fewer strokes. Like the original Lexington Collection razor, the new Power Razor uses FLEXBALL technology, which allows the razor to pivot in several directions for hard-to-reach places. The Lexington Collection also includes a badger brush and versatile stand. Shop the Lexington Power Collection at The Art of Shaving Stores. BOSS THE SCENT boasts an exclusive ingredient from Africa: the aphrodisiac Maninka fruit, evocative of passion fruit and rum. However, the Maninka also evokes something deeper and more profound: the tug of desire and the pull of memory. Set on a virile leather base, its effect is potent, original, never to be forgotten. BOSS THE SCENT is available exclusively at Macy’s. HUGO Woman is one of my fave fragrances. It's for women who are independent and live their life on their own terms. A feminine, floral, fruity fragrance with an unexpected boyish twist. Notes of heady white lilies, crisp apples, subtly sweet peaches and berries are combined with black tea, creating a feeling of fresh sensuality. A hint of ocean air revitalizes the senses and strikes a perfect balance for the modern sophisticate. Eau de Lacoste L.12.12 Rouge harvests a triple blend of spices at the heart to create this energetic scent. The fragrance is introduced with a refreshing, colorful blast of iced red tea, spiked with spicy mandarin liqueur and juicy mango. Disclosure: Some press samples were provided by the brand/PR for editorial consideration, product testing, photography and honest review.